Is Thyme Plant Toxic for Cats? Chefs love creeping thyme (Thymus vulgaris) as a seasoning for meats and other entrees, while landscapers prize the ground-hugging plant as an ornamental ground cover thanks to its colorful blossoms. Whatever your reason for growing it, you'll find the plant hardy, as it can thrive in any climate with a temperature ranging between 45 degrees and 70 degrees Fahrenheit, according to Washington State University. Instead of buying started creeping thyme from a nursery, save money by starting your herb collection from seed. Break up the dirt in your garden, using a spade to a depth of 1/2 foot, and mix in 2 inches of compost to improve drainage. Scatter the creeping thyme seeds on the soil surface, spacing each seed apart by 24 inches. If you're growing several rows of creeping thyme, Washington State University recommends separating the rows by 24 inches. Rake the planting site to cover the seeds with a thin, 1/4-inch-thick layer of dirt. Water the planting site two times every day, or as required to keep the soil surface moist. The creeping thyme will usually sprout within two weeks. Once the seedlings are 1 to 2 inches tall, reduce watering to once every four to five days while using enough water to moisten the dirt to a depth of 6 inches. Thyme leaves and flowers may be eaten. Both fresh and dried thyme have many culinary uses, most of which involve cooking with vegetables and/or some sort of meat. Thyme flowers are tiny and pink or white, and may be used as edible decorations. Prune overgrown thyme plants in midsummer when growth slows and blooms diminish to encourage a flush of new growth. Trim back growth that is 2 to 4 inches from the ground with a sharp pair of clippers. Cuttings can be used for seasoning in meats and poultry dishes. Water thoroughly to saturate the soil to the root level. New growth should appear within a few days and the plant will typically show rapid growth for the next few weeks. Repeat in late summer or early fall. Plan your thyme sowing for late February to have healthy plants in late spring. Fill a 5- to 8-inch gardening pot with light potting soil. Use a pot with plenty of drainage. Sow seeds directly on surface of soil, then sprinkle a light covering of soil on top. Plant three to five seeds in the pot to ensure at least one germinates. Keep soil moist but not soggy. Keep in a warm sunny window. Remove all the seedlings but one from the pot. Choose the largest, healthiest-appearing seedling to remain. Transplant in the garden if desired after danger of frost has passed. Plant each thyme plant 18 inches apart. Though thyme oil is recognized as safe by the FDA, it can be a skin irritant, both for humans and animals such as cats. When large quantities of oil are applied directly to the skin, the skin can become red and itchy. Though this is uncomfortable, it is generally not toxic and the irritation will subside in a few hours. If consumed in large doses, thyme oil can be toxic to humans and animals. Thyme plants themselves do not contain enough oil to be dangerous for cats, but never give your cat concentrated thyme oil. This can be extremely irritating for the stomach and can cause nausea, vomiting and gastritis. Not only is thyme not toxic for your cat to chew on, but thyme is thought to have many positive health benefits. Thyme is an expectorant for the respiratory system and can sooth a cough or sore through, even in felines. Thyme plants also have natural antibacterial properties, and in some cultures, the plant is applied to wounds to help heal them. 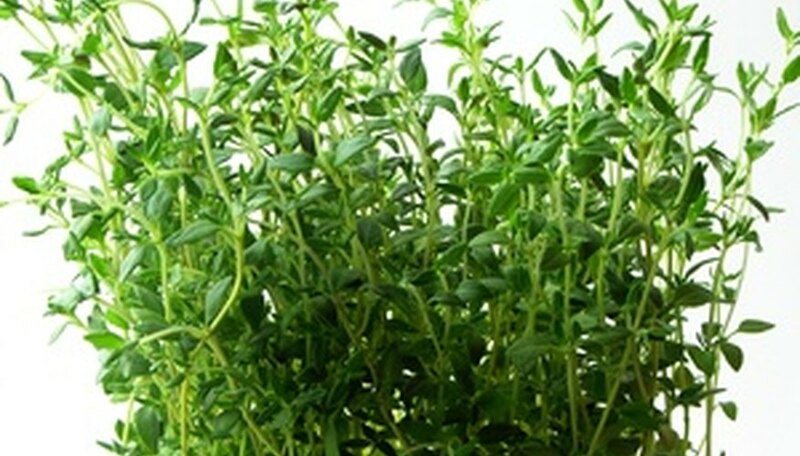 Thyme plants are naturally hypotensive, meaning that they are natural sedatives. Not only is thyme not poisonous, but like other herbs such as lavender, it can help reduce stress and calm the nerves, even for cats. Schedule your watering for the morning. Touch the soil beneath the plant to test for dryness. If the soil is dry it needs to be watered. If it is moist or damp, do not water. Attach the sprayer attachment to your hose. Wet the soil beneath the plant with the hose, gently running the water. Water until the soil is moist, yet not soggy. The soil should be moist to a depth of 2 to 4 inches.